How to market a small business in this digital age? This is the major question pops up in every entrepreneur’s mind whenever they plan their marketing plans. The other concern bothers business owners is how to manage marketing campaigns in such a shoestring budget. Being a part of this digital century, one should know that you can’t ignore the latest digital marketing strategies if you really want to survive the online competition. From social media campaigns to email marketing, pricing to branding, it’s quite necessary for every business to excel in their online marketing skills and focus to grow their business. 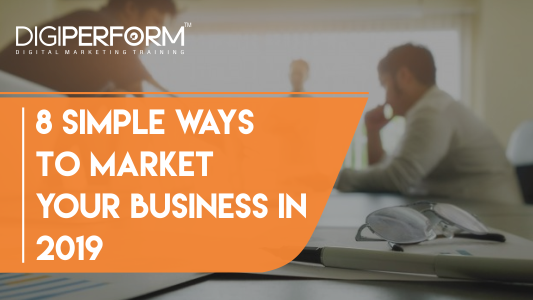 If you are still figuring what are the easiest, best and popular ways to market your business in 2019, then you have landed on the right page. Here we have listed the 8 simple ways to market your business in 2019. Digital marketing is the new playground of all the businesses, even small business is investing a lot in digital marketing, website development, link building, and AdWords analytics. Websites make your business stand out from the crowd, by means of your own business website, you create a better impression on your customers rather than your office or workplace. Websites are the new visit cards, in the digital world, no one has the time to visit your office or go through your work, on the contrary people do spend a lot of time on your website to know more about you. By creating an engaging Inbound Marketing Plan, you can make your site visitors stay engaged with your contents as well as they can become leads for you. Also, the website itself gives you the opportunity to showcase your creativity to people. With strong web hosting companies like godaddy.com, hostGator.com, namecheap.com, dreamhost.com and many more, you can register your domain and website on the internet with minimal rental charges and get going. Social media platforms are here and they are not leaving soon and digital marketing vitally stands on social media platforms. The small business needs to take major steps to form a strong presence on social media platforms, all major social media platforms must be your priority for example – Facebook, Twitter, Instagram, Whatsapp and Linkedin; they are the major source of getting noticed by people. Today Instagram is one of the most popular social media platforms and you can leverage instagrammability of your brand to increase brand awareness. Share posts, write blogs and create videos to make people notice your brand and your name in their newsfeed. You may hire a good social media management company or experts who do have a set of social media analyst and social media specialist to create a well-planned strategy for you. It is often said before and we will say it again that good content is the key. People are literally starving on the internet for some good content and stories to drool upon that they can experience, watch and talk about, interviews, blogs, podcasts, creative videos and not to mention the customized content is what that is running all over the internet. Good content can make the eyes turn and stop peoples thumb from scrolling down the feed and hit that like, share and comment button. If you’re just starting your business and want people to know about it, you can collaborate with Youtube channels (influencer marketing) and they promote your business in their new and recent videos, posts and polls. These Youtube channels make videos about relatable situations, people, work and home videos and they smartly try to slip in your brands and products within their conversation and background to make sure they advertise you well. For example – they would make a video on subjects like – “when you move in a new city.” or “when you want to buy a car” and then they advertise brands like Pepperfry and zoom car services in it. As these Youtube channels are the creators of some new age drama, videos, and web series, they have lately gathered a huge fan following and people do follow them with huge love. They surely can promote your businesses in their videos and add you to the good books of their viewers. It is very important to know your audience and to target them. Ads are everywhere, videos and links are in hundreds and thousands, pictures and posts are in millions as well then what is that which separates you from the others. You must know what are the people who really are interested in your brand or in your product, who can be your potential clients, on that basis only, your client conversion rate depends. Knowing your audience does not always means that you only need to pitch them with sales calls but to know what your audience likes and does not like is a very important factor to rely on. The right approach, the right time and the right marketing strategy defines how long you will play and stay in the grounds of digital marketing. There are a lot of good SEO working companies, for example, Walnut Folks that provide that critical SEO work to your product, brand, and website which is substantial as well as put you forward. SEO work needs to be monitored properly and all the other departments need to be catered as well. SEO Brings Quick Business Success, Search engine optimization is the quickest way of putting forward yourself in digital marketing. A Forbes article reported that SEO grabs 80% to 90% of the market share in terms of customers who check online reviews prior to purchase. For effective search engine optimization, you need to find a good service provider. Walnut Folks can be the best choice in this regard. SEO is all about managing search engines, enhancing search engine ranks of some keywords. When your business or website comes at the top spot of Google search for specific keywords, it automatically works in its reputation. SEO is affordable, for small business, SEO can bring massive returns. Search engine optimization is affordable, for enhancing sales it is the best way to look up to. It also deals with brand management and image building, caters all the other aspects like mobile-first indexing, GDPR, page speed, mobile applications, brand ranking, etc. Google AdWords is one of the basic things to look at in 2019 while marketing your business. Google AdWords are nothing but certain words and phrases in every business category that people bid on to get the maximum number of searches for their searches. Google earns quite well from this idea in searches as people need to pay for these specific Adwords and every time it is being typed and searched the businesses who paid for it immediately comes in the search results. Just like a usual auction, Adwords are bidding online with Google, The position of an ad is determined by the ad rank. The highest ad rank gets the 1st ad position. Your actual CPC will be determined by the ad rank of the next highest ad below you divided by your Quality Score. If your the only bidder than the terms and policies changes likewise. If you are establishing a B2B business. LinkedIn is the right platform for you. Lead generation is an important part of any business many potential clients and customers acknowledge you by good lead generation strategies which are mostly available in LinkedIn rather than any other social media platforms. These are few online marketing strategies that would definitely help if you are looking to promote/market your business in a positive way. Just keep your options open! How can Digital Marketing help Young Entrepreneurs?